Given that my first love of gaming is first-person shooters (FPS) based on my love of the original Castle Wolfenstein back on my Apple ][+, it is somewhat surprising that I was ‘late to the party’ on Unreal by nearly a year. But hey, gimme a break – I had a three-month old colicky baby when it was released in late May of 1998. Yes, that is right: Unreal just celebrated its’ tenth birthday! You know what that means? Retrospective time! I am going to take a look at the original game and also touch on the other entries in the series as it has moved to being one of the premier online shooters. Just a few months after Quake II landed, Epic games released something that would fundamentally change the shooter world in ways that are still felt today. Unreal featured a graphics engine that wrested the crown of ‘most OMG graphics’ from id’s Tech 2 engine after a very short time. But what Unreal brought was much more than just a solid FPS with excellent graphics, it was the bundled script editor that allowed users to make and share complex mods for the game that made this a milestone release. But since I am neither a modder nor much of a multiplayer fan, for me the impact of the game had to do with the quality of the game and the engine. While I remember much of it, I loaded it up again on a couple of computers to get a replay. Installing it again is actually an interesting side-story: my original intent was to replay it on my Mac, but the one problem with the powerful Intel MacBook Pro is that pre-OS X games no longer run. Period. Since I originally had the Windows version anyway, I figured it would be a great game to try out on the recently released Crossover Games. I detailed that experience here. But even though it worked acceptably that way, I decided to just run it on the PC. So I installed it on the Windows side of my Macbook Pro and started playing. More recently I also installed it on my new HP Mini-Note (which I discussed here.) – I will talk about that experience a bit later. Even today, Unreal scares the crap out of my kids. Well, perhaps ‘scares’ isn’t the right word – the screams in the opening prison level are disturbing and really freaked them out when I showed them some of the first level. What a wonderful way to start a game – you wake up in a cell in a prison level that is falling apart all around you, and all you hear are screams and moans and an automated announcement system with a female voice matter-of-factly talking about prisoner escapes and reminding inmates of the benefits of cooperation. One thing is immediately clear – you are the only living thing you see, and if you want to keep it that way you need to find a weapon and escape. As you play you discover that you are on a prison ship called the Vortex Rikers and that you have crashed into the planet of Na Pali. Of course, that doesn’t explain the screaming you hear and the creature you see leaving an area after wiping out a group of humans who survived the crash. Na Pali, it turns out, is home to a peaceful race called the Nali who have been enslaved by the Skaarj and races subservient to them. This puts you on a collision course with the Skaarj, and you realize that you will need to deal with them before you have any hope of escaping the planet. The next couple dozen hours are spent working your way through areas, exploring all of the dark spots, keeping Nali alive so they can show you secret areas, and just trying to survive! Unreal plays much like any shooter from the late 90’s when viewed with a decade of hindsight, featuring clear levels with end bosses and switches and doors to open and so on. Indeed it is really a step back from something like Jedi Knight in terms of integrating narrative into the game experience. So why is it such and excellent game that warrants replay a decade later? Quite simply because it still looks great but more importantly because the gameplay rocks! While enemy intelligence had been improving incrementally in shooters over each of the previous five years since Wolfenstein 3D, in 1997 and 1998 games came along that introduced new levels of enemy AI. 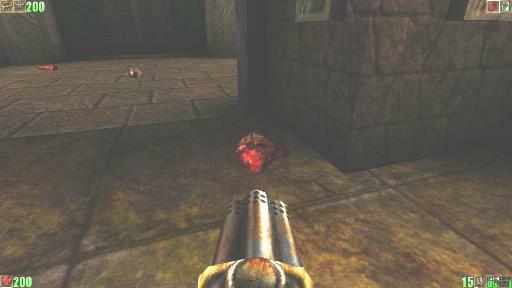 In Jedi Knight, while the majority of enemies were fairly standard FPS fare, bosses such as Jerec utilized tactics and strategies that were much different than the standard ‘mega-bullet-sponge’ bosses gamers were used to encountering. 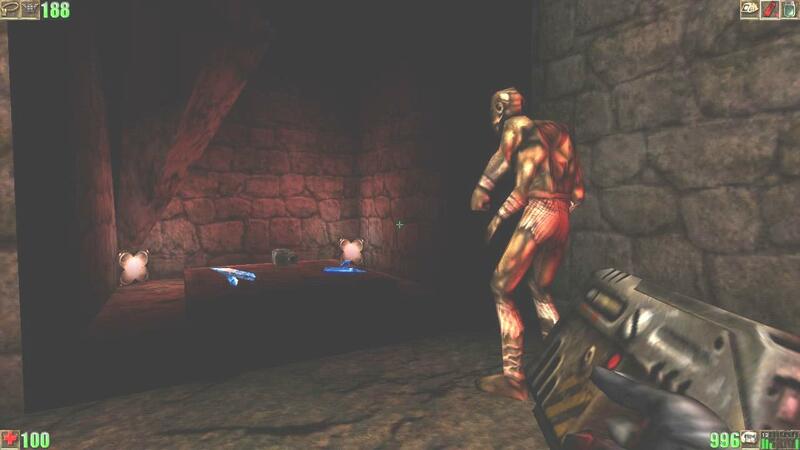 Quake II also had more intelligent enemies, but compared to Unreal they seem barely more intelligent than Doom Marines. 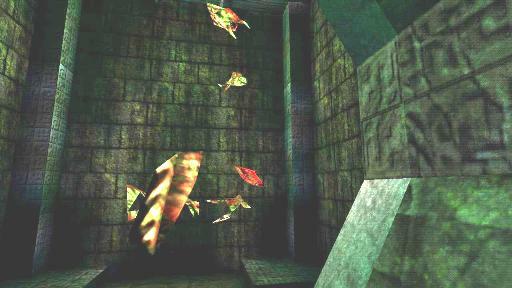 In Unreal, enemies would dodge, jump, run, and otherwise use defensive means to their advantage. Again, it is fairly rudimentary in a post-Far Cry world, but in the context of early 1998 FPS it was earth-shattering. No longer was difficulty measured only in terms of how many bullets an enemy would take to fall and how many enemies would come running straight at you; now you needed to deal with enemies that had some sort of self-preservation instinct. The game gave you added tools to deal with these more intelligent enemies: in general you now needed to actually aim at them because while there wasn’t true locational damage, headshots would take out enemies quickly. Good: the ‘immersion factor’. I know, someone please kill that overused term already! But Epic really ‘got it’ with respect to instantly creating a mood of fear and survival and then sustaining it. No grand cutscenes to introduce you to your situation, you just wake up, see destruction and hear screaming – and know you want OUT. Bad: Level design notes. I love the levels, but having a new level start by telling me the name and info about who made it? I had to remind myself that this was the time of ‘rock star’ game designers, but it steals from the continuity and storytelling. Good: Non-linear gaming. Not in the sense of even older games like Betrayal at Krondor, but Unreal features large areas that just beg you to explore them. 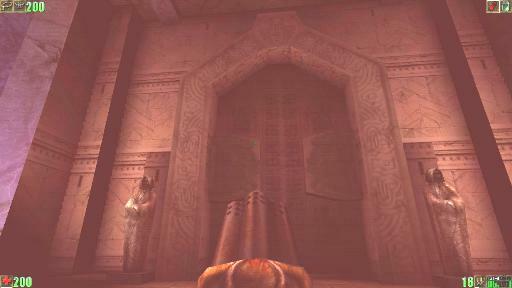 Of course, it is all an illusion, similar to Quake 2 making you backtrack between areas to complete tasks. But it takes away much of the ‘led by the nose’ feeling of typical corridor shooters. Bad: Pointless wandering. I remarked in my Jedi Knight retrospective about the massive levels in that game that were at times exhausting. Unreal never exhausted me like that, but there are many very large levels. However, many of those levels get tiresome or even boring. It is at those times you are reminded that you are still playing a typical find the button / card shooter that is dressed up in modern clothes with many tricks to make it feel different. Good: The graphics. This might sound strange for a ten year old game, but it still looks quite good. One thing that I love about replaying Unreal-engine games is that the environments scale very well on modern hardware – things like the reflective floors in Deus Ex and the outdoor areas in Rune look better than games released much later. Ugly: Blockheads. While most of the graphics have aged nicely, the characters look terrible. It isn’t that I’m expecting them to look like they were done with the Source engine, but the mismatch between everything else and the characters is staggering. As reference I think of Jedi Knight – while the game runs at 1900 x 1200, it looks its’ age at every resolution, and more importantly all aspects share a visual style. Having a gorgeous outdoor view and a bunch of blocky characters is quite jarring. Good: Getting beyond ‘kill them all … all of them!’. In the best of areas, you get what one review called “action of Quake II with the puzzles and atmosphere of Hexen II”. There is plenty to do in Unreal other than just shoot stuff. The Nali will help you find secret routes and areas, there are plenty of hidden things to find, and there is generally a feeling that you are part of an actual world rather than just romping through levels. Good: Backwards storytelling. When you start Unreal, despite the nice immersion into the world of a prisoner on an alien ship, you get the feeling that is all the story you’ll see. You assume that this is another game in the id Software tradition of settig up a scenario and sending you off to just kill everything. By the end you realize how wrong you were. Along the way you have learned about the peaceful Nali (and hopefully not killed them), and how the Skaarj have dominated them and others. While there is no sense discussing how the system runs on modern hardware (especially since one of the systems I was replaying it on was the one I used to play the current barometer of graphics muscle – Crysis), it is worth remembering that this was released in the days where 3D graphic cards were still optional in games. 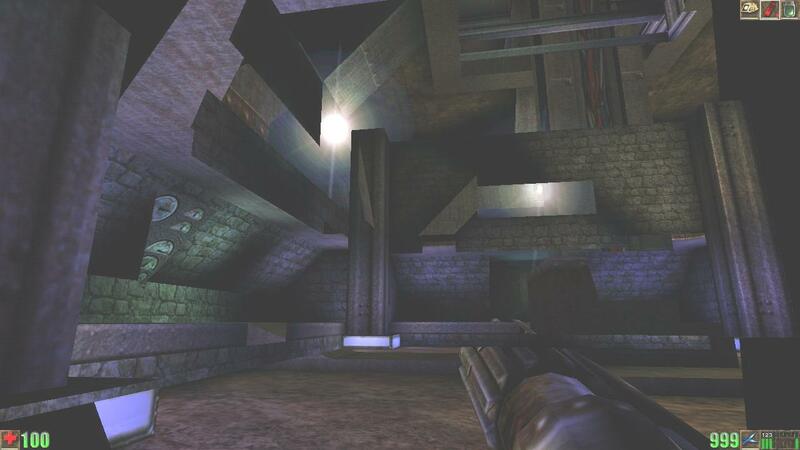 It was even possible to play Unreal this way – and one review mentions that the unaccelerated Unreal looks better than the accelerated Quake II. Looking back at many reviews there is a common focus on two things: graphics and system requirements. Many reviews talk about the gameplay and depth and story and so on, but every single review I found gushed over the graphics but bemoaned the hardware requirements to get those gorgeous graphics. They also complained about the load times, which could be well over a minute on common systems. As I mentioned, the graphics look great on all of the systems I tried – but everything else also works great. The load times were minimal to the point I didn’t even make note of them, and I had forgotten how cool the dynamic music system was – most games of the time featured long segments of mini or CD audio, and transitions were typically fairly jarring if they happened at all. Unreal had small music clips that allowed fast changed according to events and enemy encounters. Years later many games still have troubles pulling off the dynamic music feat as well as Unreal. I had mentioned that I installed the game on my HP2133 Mini-Note ultra-portable, and linked it up to a Apple ‘Might Mouse’ BlueTooth mouse. Once the game is installed there is no CD requirement (hooray!) so playing the game is simple to do just about anywhere. The HP2133 has integrated 3D graphics with shared memory and components focused on low power consumption and portability, but does have a high speed 7200RPM hard disk and 2GB of RAM. I was concerned how it would run since this was the first shooter I had installed on the system, but went ahead and turned up all settings and resolution to maximum. The game was smooth and responsive and everything looked great – in fact, all of the screenshots for this article were taken from the HP2133 (but sadly the ancient UOSU screen grabber I like isn’t too reliable under Vista so many of the shots I took were garbled). Load times weren’t a problem, and the game didn’t tax the CPU/GPU to the point of making the system get hot. A quick thought – I never did anything with multiplayer in Unreal, not then and not now. The reviews basically called it ‘broken’ on release, but apparently it improved considerably over time. However, the release of the Unreal Tournament series has long since killed the ability to find a multiplayer game for the original Unreal even if I had wanted to try it out again. The release of Unreal Tournament was a bit of a puzzler to me – I was really a single player gamer with occasional multiplayer, and had missed the build-up to the release of Quake III and Unreal Tournament. My wife grabbed it for me and gave it as an early birthday present so I would have it for a week-long business trip. I played through the ‘single player’ part, waiting for something to happen, and also got in some multiplayer. But it really didn’t grab hold of me all that much. I only skimmed the next two entries – one of which it seems has been removed from history (UT 2k3) – but enjoyed the most recent entry (see my GamerDad Unreal Tournament III review). 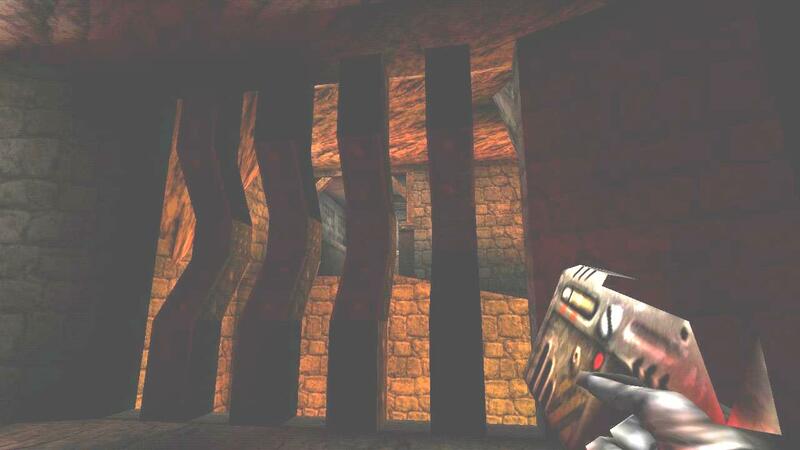 It remains a very fun way to have a mindless frag-fest, and it all goes back to Unreal in 1998. One question that often comes up is “is a ten-year old M game still something to keep from kids’? As I mentioned, Unreal scared the pants off my kids – the screaming and haunting environs remain very effective. In more open areas there isn’t the same level of terror, but the fierce and bloody combat remain very graphic and keep this a definite M-rated experience. 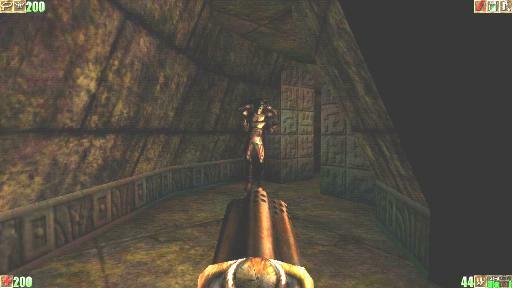 Many reviews called Unreal ‘one of the best shooters ever’ on release, and said it was the one of the first games to really live up to the ‘Quake killer’ moniker assigned to any new shooter released at that time. But how do I regard it after playing through again? Is it still the epic shooter it was in ’98? Is it worth playing if you missed it for some reason or were too young? Well, although the graphics have aged well, time has been less kind to other aspects of the game than others of its’ time. Using my old standby Jedi Knight again, while the Quake III-based Jedi Knight II and Jedi Academy have better graphics and lightsaber combat, the original remains one of the best designed games ever and is still worth playing as I mentioned before. 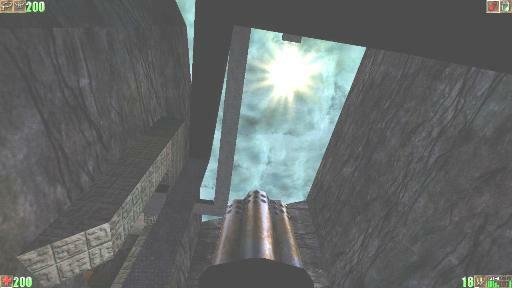 Unreal’s levels are at times disjointed based on the individuality of the design, there are some balance issues with weapons, and there are too few enemies. These issues stand out more based on the microscope of perspective. Yet time also makes it possible to play this on just about any PC that still runs, and get excellent performance. But what time hasn’t tarnished is the gameplay, the excellent level design, the nice way the story unfolds, the cool weapons, and the overall sense of fun playing an excellent first person shooter. This game grabs you fro the start, and while there are some slow points in various levels you still want to keep going and find out what is next. It is a worthwhile game to seek out and play – certainly it is much better than the bland sequel and the majority of mediocre shooters found on the list of games made with the Unreal engine. It is not the best FPS ever, and probably not in the top 5 and perhaps not in the top 10. Yet while it is easy to dismiss it as an ‘impact game’ – a game that had a huge impact but is by itself irrelevent at this point – that would be a mistake. As some reviewers realized ten years ago, what makes this game great isn’t the pretty graphics and effects but the well thought out design and pacing; there are prettier games released every week now, but precious few combine action and adventure and a keen sense of survival and mood so well as this Unreal game from 1998. Queen tree 9:29h.Apple or pear. source stink the demo 4 real.queen from chappel? tell my neibher to choop the tree.